My camellia is still swathed in sheets of fleece. I’m waiting for the early morning frosts to end. Last year I removed the fleece too soon and none of the buds flowered. The previous year I kept the camellia wrapped in fleece until the end of April and there was a profusion of blooms. I counted over two hundred and the plant made a stunning display. The weather forecast is none too specific about where late Spring frost is likely to occur so I’m erring on the side of caution. I’ve always assumed that the saying refers to the month of May. Meaning May is out – the new month has begun. In other words, don’t pack away your winter clothes until May 1st at the earliest. But according to a BBC News Blog the reference is to May blossom: the blossom of the hawthorn hedgerows. The Phrase Finder explains that the earliest known version of the rhyme dates from 1732 from a Dr. Thomas Fuller. Although it may have existed in word-of-mouth form well before that. which can also be read as either the month of May or as the May blossom of the hawthorn. As it was Shakespeare’s birthday a couple of days ago it seems appropriate to quote Sonnet 18 although I’m more bothered about frost than rough winds. Elyse Bruce of the Historically Speaking Blog has an 1855 version of the rhyme from the Whitby Gazette and some more fascinating information on the subject of May blossom. What to do about the fleece on my camellia? The May hawthorn blossom is already looking spectacular in the Yorkshire Wolds yet we had a sharp early morning frost this morning with a sprinkling of snow. I’m sticking with my original understanding of the saying. 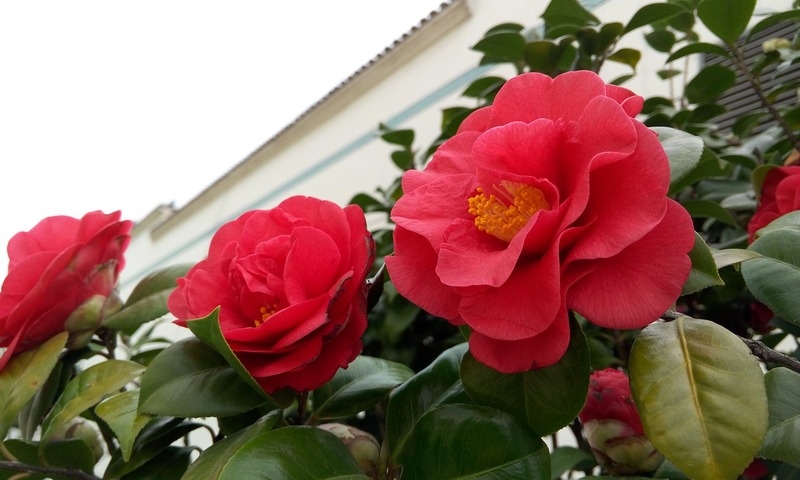 I’ll wait until the month of May has commenced and then remove the camellia’s winter clothes! Previous Best GE17 video I’ve seen so far….